In case you hadn't already been clued in by, say, every single thing said by every single person in your Twitter feed for the last two weeks, it’s World Cup season. Admittedly, though, not everyone on social media is interested in sports—some people like Game Of Thrones, instead (the Venn diagram of these two demographics covers all social media users on the planet). The two have a lot of similarities, actually. Political maneuvering, vicious battles between hated rivals, the fates of nations hanging in the balance… One has more dragons than the other, sure, but no comparison is perfect. Costume designer Nerea Palacios has apparently noticed the similarities, too. 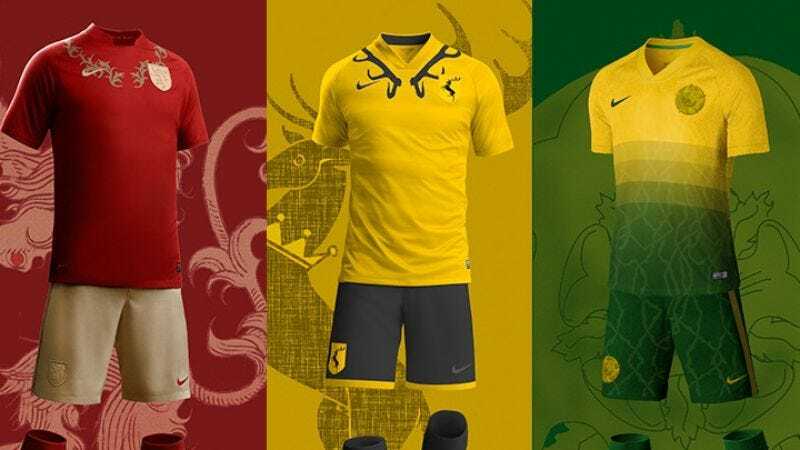 Palacios has produced the following set of images, depicting World Cup kits for each of the major houses of Westeros (plus the Night’s Watch), thus combining all of the things that anyone cares about on the Internet, forever—the House Lannister duds even include a kitty cat, just to make sure every base is covered. Each uniform incorporates the House colors and sigil (including House Bolton’s always charming flayed man), as well as other details, like House Baratheon’s stag horns worked around the collar, or the vines of House Tyrell’s flowers. You can see the rest of the designs, including the Starks, the Targaryens, and the Martells, in this gallery.